From version 3.4.6 Appointments plugin is able to handle downloadable files for scheduled appointments. Feature is very useful, when you want to share some files with you customers prior or after the appointment. These files are only accessible by your customers. WooCommerce already incorporates downloadable products for simple products, but it’s very useful to also add downloadable files for appointments. On many occasions you want your customers to have access to files like tour guides, training instructions, meeting preparation files etc.. Now, that’s possible and you can very easily add this to your appointments. Learn how to handle digital/downloadable products here. 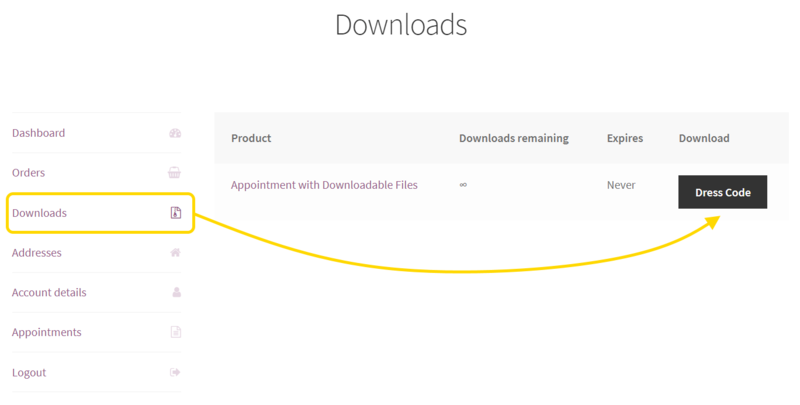 Files will become accessible to your customers only when appointment has been paid for inside their account > downloads section on your website. For convenience, files are also accessible directly inside customer’s order details.